Reptiles Do Not make heat for themselves, but maintain necessary body temperatures by taking heat from their environment. The required body temperature varies according to the species, the time of day, and the stage of digestion of food. For this reason, the temperatures must vary over the floor of the vivarium. In the wild, and in properly constructed outdoor lizard enclosures, the heat is provided by the sun. All reptiles benefit from lighting that closely resembles the sun, even nocturnal animals will bask in sunlight from time to time. 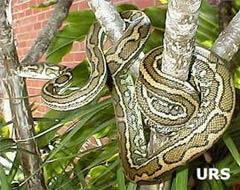 Ultraviolet Light (UVA & UVB) is essential for Lizards also Diamond Pythons, and will benefit all Reptiles. UV lighting is required to take up vitamin D3, which is essential for the conversion of calcium, its absence will result in illness such as Metabolic Bone Disease, and Calcium Rigor (i.e. ricketts, dragging of the hind legs and spinal deformities). The danger of overheating by sun through glass means that the only satisfactory method of lighting is to use the correct UVA & UVB tubes, U.R.S. (Ultimate Reptile Suppliers) recommends Reptistar tubes for all your reptiles or ReptiSun 5.0 tube for lizards and ReptiSun 2.0 tube for snakes and pythons. CAUTION: ELECTRICITY IS DANGEROUS. Use a qualified electrician. However, remember that electricians Are Not experts in reptile heating and lighting requirements. There are two main types of heat, basking heat for reptiles which spend a lot of time on branches or high in the cage, and ground heat for reptiles that spend a lot of time on the ground. Most heat sources should be connected to a thermostat. This is provided by an overhead heat source, usually a ceramic heater, basking lamp or an infrared lamp, all of these heat sources are available through U.R.S. These should be placed so as to provide a basking hot spot, and to provide general heat throughout the vivarium. White lights must not be used at night. Heaters can be left unshielded in lizard enclosures, but shields of fine mesh are essential in snake vivaria to prevent them from burns. In shallow vivaria ground heat is suitable, although radiant heat from the basking heater can warm the substrate sufficiently, especially if a piece of slate is placed below the heater. In taller vivaria or in very cooler climate locations, additional heating will be required at floor level. Low level heating can be provided by the use of heat pads, heated hides, and in some cases, hot rocks, all of these are available through U.R.S. It should be noted that hot rocks or rock heaters are not heat emitters, but provide a warm surface for belly heat only like an electric blanket, and do not warm the vivarium, in the case of some venomous snakes, such as adders, ground heat only can be adequate. WARNING: Most European and American books assume that a vivarium will be in a air conditioned room at 22 degrees celsius. Many examples given will not apply to local conditions. Because reptiles need to vary their temperatures, they must have a choice of ground and air temperatures within their enclosure. `Thermal Gradient` is a term describing temperatures ranging from mild to hot from one end of the vivarium to the other. Differences of 5 degrees to 8 degrees celsius are usual, depending on the species kept. For this reason, heating should be set up at one end of the vivarium only. Vents should be in all enclosures to let the air circulate. Because temperatures vary greatly in most homes and depending on your enclosure, it is wise to use a thermostat to properly control temperatures, and ensure the safety of the animals. Overheating can be even more dangerous than under heating. U.R.S. has thermostats available, basic thermostats that need to be wired up by an electrician, and thermostats with a probe and power cord ready wired, simply plug heat source into thermostat and place probe in the center of the vivarium. Thermostats without probes must be placed in the center of the vivairum, usually on the back inside wall. No animals should be heated without a thermometer in the enclosure to monitor the performance of the heater. One should be fixed alongside the thermostat, while a second thermometer can be moved around the vivarium to check the thermal gradient. Remember that glass aquariums lose heat readily and are not really suitable for keeping reptiles. A properly constructed wooden vivarium retains heat, and provides for easy mounting of light and heating equipment. Quality Vivariums are available through U.R.S. 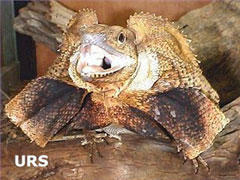 UVA and UVB lights are needed for most reptiles. This can be provided using a Reptistar fluo tube for all your reptiles or the ReptiSun 5.0 for lizards and turtles and ReptiSun 2.0 for snakes, pythons, amphibians and arachnids. Reptistar and ReptiSun tubes are made especially for reptiles, they simulate sunlight by providing the beneficial UVA and UVB wavelengths which increase appetite, activity and reproductive behavior in captive reptiles and also prevents diseases and infections occurring. Do not use the extremely strong "Blacklight Blue" (BLB) tube or poster globes. Eight watt mini lights are definitely inadequate. The UV tubes should be fitted in a batten, and turned on for daylight hours only. UV tubes have a limited life and must be renewed every six to twelve months even though they still show visible light. As with heating, shielding of the light is not necessary for lizards, but is a must for snakes and pythons. Shields should be made of smooth mesh. Plastic diffusers will not allow adequate UV rays to reach the reptile. UVA and UVB tubes are not heaters. A UV tube will increase temperature by about 2 degrees celsius in the immediate vicinity of the tube. They do not provide adequate heat for the rest of the vivarium. On extremely warm days lights may have to be turned off to prevent overheating.